It’s Friday the 13th, but for All Time Low and You Me At Six fans in Manchester, there’s not a chance of bad luck. The aim of this co-headlining bill is simple – take two of modern rock’s best loved bands, stick them in some of the country’s biggest indoor venues and see what happens. Before that though, Walk The Moon  take to the stage, and it seems that this most superstition-ridden of days hasn’t taken its toll on them either, as they get a resoundly positive response for a support band, especially one that, when they first arrived, were relative unknowns. Apart from a few moments where they come across as too wacky for their own good (sporadic blasts of squealing keys being the main offender), their throbbing dance-rock is actually really great. Spend Your Money and a hugely infectious Shut Up And Dance are perfect introductions for the uninitiated, while a cover of The Killers’ All These Things That I’ve Done goes down a treat. They may have arrived underdogs, but Walk The Moon have definitely left with a few new fans. This tour is actually the first proper arena run that All Time Low  have ever done, but judging by what they dish out tonight – an hour and a bit of pure, euphoric pop-punk jams – it won’t be their last. Entering to a recording of Carl Sagan’s Pale Blue Dot, they hit the ground running with a huge A Love Like War, with their status as an arena band firmly sealed from then on. There are hints of pop-punk’s elder statesmen in their stage presence – the call and response “Wheeeey-oh!” chants that precede Stella are lifted straight from Green Day’s live show, while frontman Alex Gaskarth and guitarist Jack Barakat trade puerile jokes in between songs like Blink-182’s Mark Hoppus and Tom DeLonge did before it seemed a hackneyed attempt at nostalgia (and when Tom was still in the band, obviously). Their set is more than just cribbing from other bands though; they have an identity of their own, and it’s on display throughout. The likes of Time Bomb and Weightless pack out the arena in terms of singalongs, while a tender Therapy sees the pace brought down a few gears, with Alex taking to the stage on his own in front of a sea of phone lights. Even from the seats the energy is palpable – those standing are like one giant organism, jumping, clapping and fist-pumping in time to such vital tracks as Damned If I Do Ya (Damned If I Don’t) and newbie Something’s Gotta Give. A duo of a triumphant The Reckless And The Brave and an enormous Dear Maria, Count Me In round things off, and provide one final justification that All Time Low are more than ready for venues of this size. 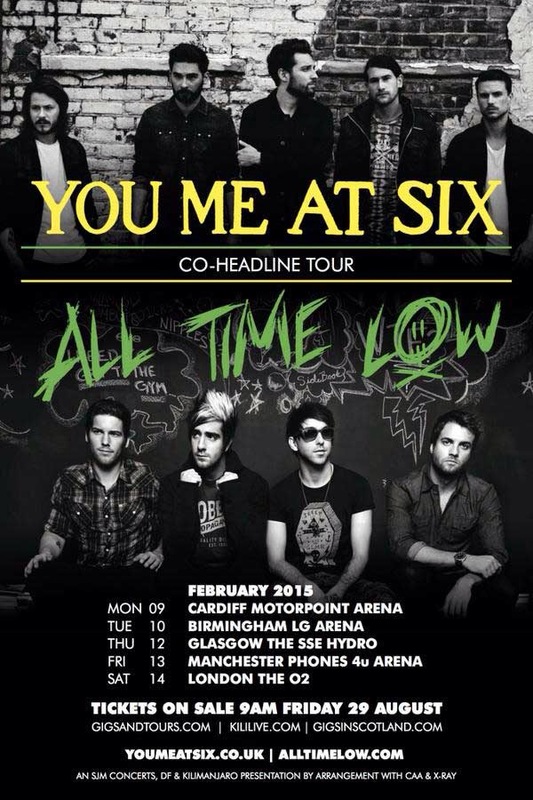 For You Me At Six  on the other hand, arenas have been their stomping ground for some time. Having already conquered Wembley and having massive success in a support slot to 30 Seconds To Mars, headlining venues like this is the next logical step, and a downright menacing Room To Breathe portends their arrival. Where they fall down is that they’re not as vibrant as those that preceded them, partly due to frontman Josh Franceschi’s broken ankle, but mainly due to the actual songs. Still, they more than make up for it with how mind-blowingly massive the songs sound. What they’ve got in their arsenal is exactly the sort of material that would fly in arenas, and fly it does – Carpe Diem brings a glimmer of Los Angeles sun to Manchester, while the bouncy lilt of The Dilemma sees the Surrey lads going at full pelt, and the heartfelt pairing of Crash and Fireworks slow things down for some absolutely colossal singalongs. Production wise, all the hallmarks of an arena band are there – cannons of sparks erupt at the back of the stage; fireworks go off in every possible direction; streams of confetti explode during a swaggering Reckless; everything just feels like You Me At Six have finally made it to a level where they can be as decadent as they like and get away with it. A three song encore finishes the event off – a ferocious Bite My Tongue, a pacey Fresh Start Fever and Lived A Lie, which just sounds like the biggest song ever written. It’s the perfect end to a night showcasing two bands at the very top of their game, and two bands that are definitely ready to join the arena circuit regulars.